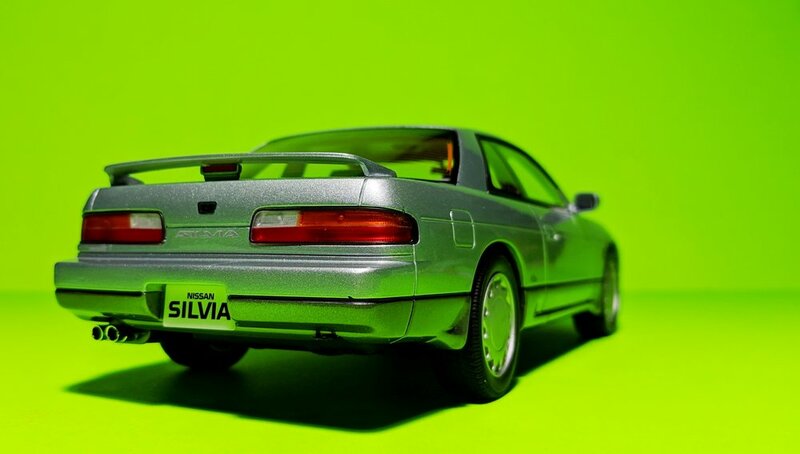 This is the S13-generation Nissan Silvia. If you see one of these on the road, you’d be wise to keep your distance. 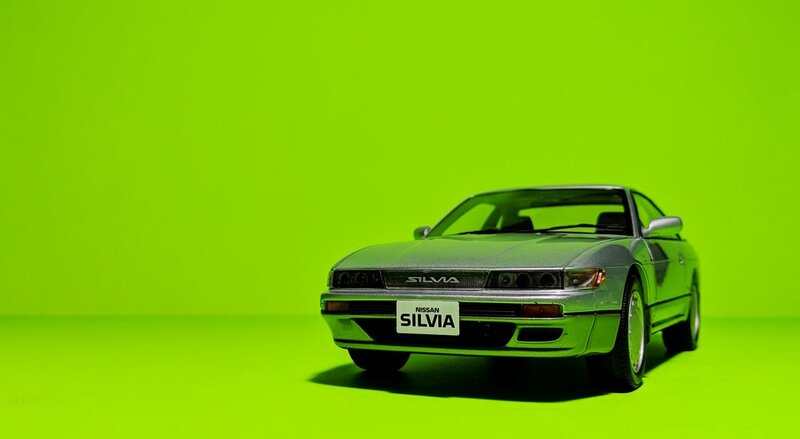 The Silvia has a long lineage that dates back to the 60’s, but the ones that we are most familiar with are the later models: the S13, S14, and S15. They’re popular amongst aspiring teenage drifters because of their affordability and the gobs of aftermarket support available for modifications and repairs. I’ve once witnessed a S14 driver casually, skillfully, and gracefully power-oversteer through a U-turn, and it left me in awe considering how narrow the street was and how little margin for error there was in that instance. In hindsight, I wish I had followed to watch the rest of the show. Of course, not every owner is as skilled, and even the most proficient drivers slip every once in a while, so my advice remains steadfast. Be careful when you’re near one of these things. Put in the hands of adolescents and wanna-be racers, it’s no wonder why it’s extremely difficult to find a clean example of one of these S-chassis cars that hasn’t already been modified, mutilated, damaged, or destroyed. The scale model presented here reflects what would be a unicorn in the real world, and - let’s be honest - it’s a rather mundane-looking vehicle. 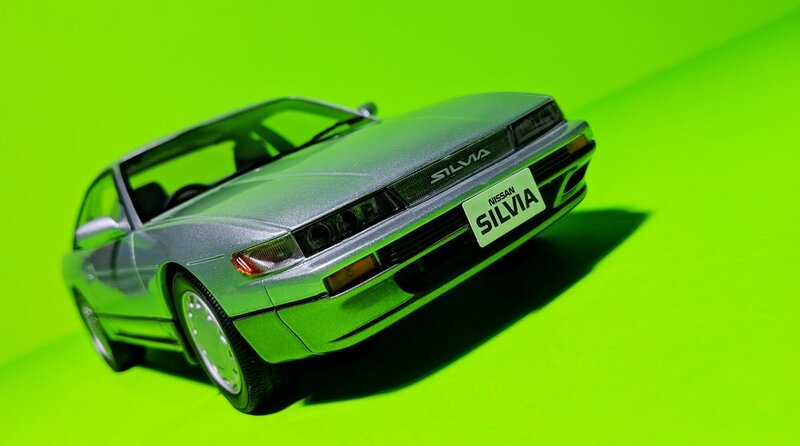 The S13 Silvia was produced in three different body styles - coupe, hatchback (called the 180SX), and convertible - this one being the Japanese-market coupe. Over here in the states, the Silvia was badged as the 240SX for all three types, and the style most commonly found on the streets is the hatchback. 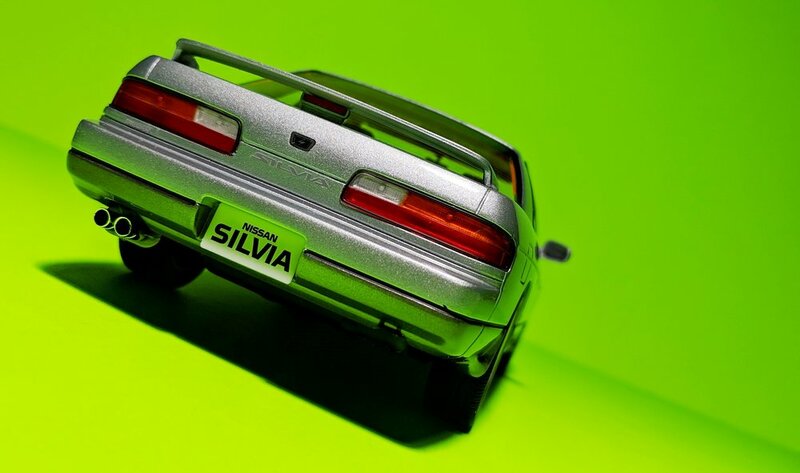 Americans have a thing for car names that are a combination of numbers and letters rather than something that actually sounds good like, you know, Silvia. The version we got also came with pop-up headlights rather than the exposed ones shown on this model. Most prefer the look of the latter because, you know, the grass is always greener on the other side. That, and the fact that the pop-up gimmick is more expensive to repair and replace while also weighing the car down. Swapping the front clip of a hatchback 240SX/180SX (with the pop-ups) with the one from the JDM Silvia S13 (with the exposed lights) is a popular modification with owners, giving birth to what’s known as the Sileighty. Front end of a Silvia, rear end of a 180SX. 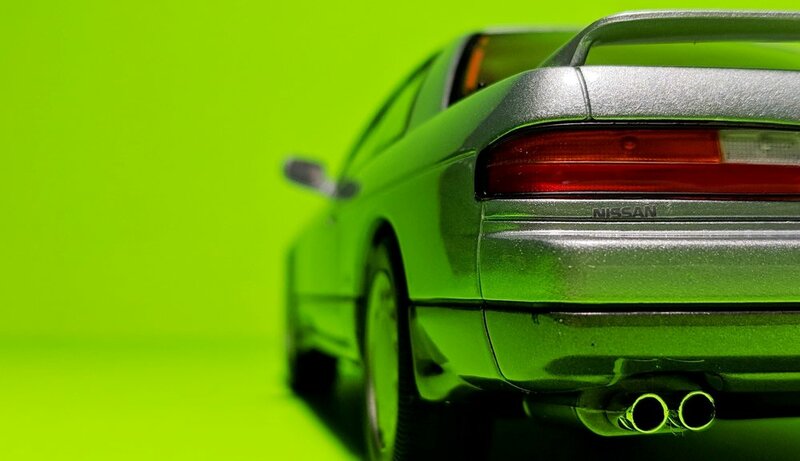 This two-tone, green-over-gray Silvia K’s is brought to you by Kyosho and its Samurai series. 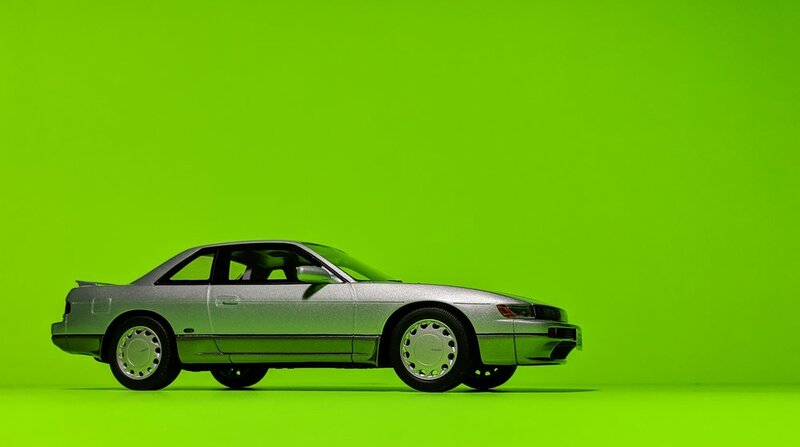 K’s denotes the turbocharged trim level of the S13. Other letters of the alphabet include J’s and Q’s, in case you’re wondering, but the K’s is the one you want if you’re into performance. True to its name, the Samurai line specializes in resin models of automobiles hailing from the land of the rising sun. The level of detail is middle-of-the-pack within its competition, but they’re priced closer towards the high end of the spectrum. They look and feel like repackaged GT Spirits, but with a 50% price increase. Which, to put it nicely, is just another way of saying that they’re not great value. Despite all that, I’ve found myself buying quite a few of these Samurai models because I love the cars that they produce. 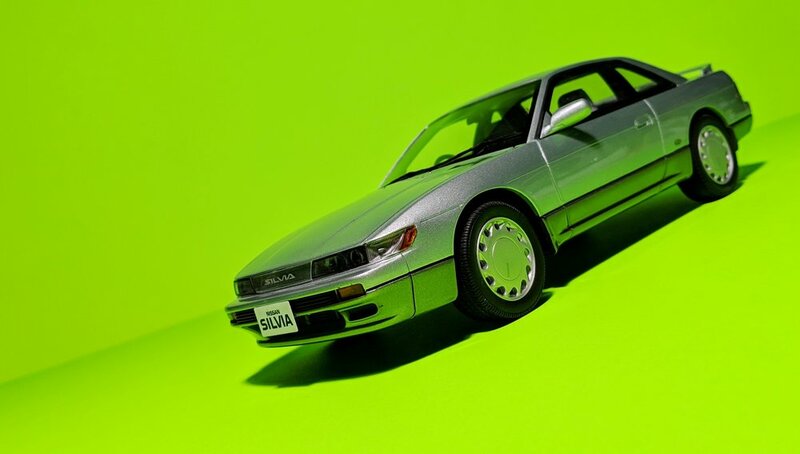 You won’t find another S13 in this scale, so it’s cave in or miss out. I wouldn’t say no to a Sileighty either. Even better, how about a Nissan Stagea? C’mon guys. Make it happen!